NEW YORK (CNNMoney.com) -- Tom Allen's General Motors dealership used to employ 49 people. Between the Detroit giant's bankruptcy and the termination notice he got last May for his Chevrolet and Cadillac lines, 26 employees have either been laid off or left. But in March, GM reversed course and notified Allen that his Monroe, Mich., store was one of 666 dealerships chosen to live on. Now in the final stages of finalizing his franchise reinstatement, Allen is already lining up interviews to start hiring again. 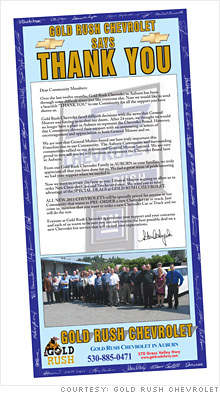 Gold Rush Chevrolet is running ads in the local newspaper to tout its return. Three generations of Allens in their Michigan showroom. The word "caught on like wildfire" through his local region when the reinstatement came through, Allen said: "They say bad news travels fast -- well, this good news travels very fast." Across the United States, hundreds of dealers like Allen that have spent the past year in limbo are preparing to get back to business. Negotiations with GM are proceeding at different paces, but some dealers say they're close to finalizing contracts and will be able to order new cars from GM again as soon as next week. Steve Snyder, president and owner of Gold Rush Chevrolet in Auburn, Calif., plans to restock with 35 to 50 brand-new vehicles in May -- and he's readying a barrage of local radio, television and newspaper ads. "We are in the process now of letting everybody know that we are back in business," Snyder said. "We have been letting them know that they can come in and special-order something and they can get exactly what they want." A painful year: Snyder kept nearly all of his staff despite his franchise termination, but at a steep price. One car washer had to be let go because there weren't enough cars left to wash. The rest of his employees took a 10% pay cut, and instead of covering the full cost of benefits, Snyder had to cut his subsidy to 50%. "Everybody else hung in there with us and we hung in there with them," he said. The staff kept busy selling the remaining inventory, dealing used cars, and training to work with the Subaru vehicles Snyder sells on another lot. "Nobody left, because they understood it was a tough economy," he said. "As soon as we pay off the debt that we had to incur in this tough economy, we will reinstate their wages." Snyder plans to hire four to eight new workers to staff up for the reinstatement -- good news in an economy starved for jobs. "We put in a job [ad] in the local newspaper for service cashiers. That is a $10 to $12 per hour job," he said. "We got 36 job applications." Mark Revord, part owner and general manager of Clyde Revord Motors, is also relieved to be getting back to work. GM gave terminated dealers until Oct. 2010 to cease operations, but it immediately stopped selling them new cars. Without new vehicles coming from GM, the lot emptied at the Everett, Wash., dealership Mark's father started in 1979. "We are down to about two new cars in inventory." But Revord recently signed his reinstatement paperwork and is gearing back up. "Our customers have stuck with us," he said of the past year. "It hasn't been easy, I will say that for sure. It has been a lot of work." Still in limbo: Not all of the 2,000 dealers GM cut last year are celebrating good news. More than half of the axed dealers appealed their termination and began preparing for an arbitration hearing. In March, GM reversed course and said it would offer to reinstate 661 of those dealers, a total it later upped to 666. But some 400 dealers are still working through the arbitration process. Chrysler, which cut 789 dealers from its network, offered to reinstate 50 but is also arbitrating around 400 cases. Those hearings are just beginning. GM started its first three this week, while Chrysler has held four hearings so far, according to company representatives. Congress set a June 14 deadline for all of the hearings to be completed, but allowed for a 30-day extension at the arbitrator's request. GM and Chrysler both say they expect hearings to continue through July. The reinstatement process: Those who did get reprieves will need to comply with the auto maker's terms for reinstatement. GM slapped those terms with confidentiality requirements, and dealers are reluctant to discuss them. Franchise contracts typically spell out requirements for the dealership's capital financing levels, minimum sales and physical appearance. Several dealers said they found their specific GM terms sheets fair. "All I can tell you is that the five conditions in this letter are reasonable, and in fact they are conditions that I would expect them to ask me to meet," Snyder said. In Stuart, Iowa, Morrison Chevrolet owner Jerry Vitzthum is still waiting for the details on what he'll have to do to get his franchise back. Still, he's relieved to have the chance. "I am sleeping better at night," Vitzthum said. "The dealers I have talked to say they are all in a waiting mode. We just hope [GM doesn't] jump into the whole mode of saying everybody has to have a new facility." A few dealers who were offered reinstatement say that instead of a terms sheet, GM came back with a buyout offer. Snyder was one of them. A GM representative "came out and we talked about a monetary settlement, but I said, 'What I would really like is to have my franchise back,'" he said. "I don't know if [the offer] was fair or not fair, but when I analyzed it, personally I would rather have the Chevrolet dealership back." When Snyder pushed, GM backed off and agreed to go forward with his franchise revival. Persistence also paid off for Allen, in Michigan. After his franchise was axed, residents of Monroe sent hundreds of protest letters to GM and to their Congressional representatives. When a GM representative visited Allen's dealership, customers approached the representative to demand that the dealership be reinstated. 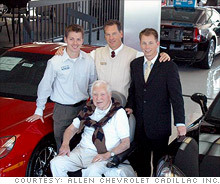 One of his customers "talked to the GM employee and said, 'If Allen Chevrolet Cadillac is not back as a dealer, this is the last GM vehicle I will ever buy,'" Allen recalls. "When you have your customers fighting for your existence, how can you let them down? You can't."